Glenfiddich Janet Sheed Roberts Reserve Single Malt Whisky Goes under the Hammer for $94,000 at Exclusive Charity Event Hosted by Adrian Grenier. NEW YORK, March 16, 2012 /PRNewswire via COMTEX/ — An extremely rare bottle of Glenfiddich, the world’s most awarded Single Malt Scotch Whisky, sold at auction last night for a record-breaking $94,000, in celebration of its 125th anniversary. 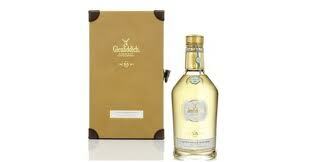 The bottle of Glenfiddich Janet Sheed Roberts Reserve, one of only 11 bottles in the world, shattered the record for the most expensive bottle of whisky ever sold at auction. The evening, held on New York’s Liberty Island, was hosted by famed actor and environmentalist Adrian Grenier, with proceeds benefitting SHFT Initiatives, the charitable arm of SHFT, which was founded by Mr. Grenier to promote sustainability issues through the intersection of commerce, art & design, and communication. This extremely rare whisky was created to commemorate the 110th birthday of Janet Sheed Roberts, granddaughter of Glenfiddich founder William Grant in late 2011. This offering has quickly established itself as the benchmark for fine and rare whiskies, with Bottle #1 fetching an unprecedented 46,850 pounds Sterling ($72,630) at auction in the UK in December 2011. Bottle #2 was subsequently sold for 44,000 pounds at an event hosted by HRH Prince Harry. The sale of this third bottle reaffirms the brand’s position among the world’s most valuable Single Malt Whiskies, and is a fitting tribute to the distillery’s 125 years of pioneering achievements. The event was co-hosted by Glenfiddich Malt Master Brian Kinsman who travelled from Scotland to oversee this auspicious occasion and kick off the brand’s year-long 125th Anniversary celebration.